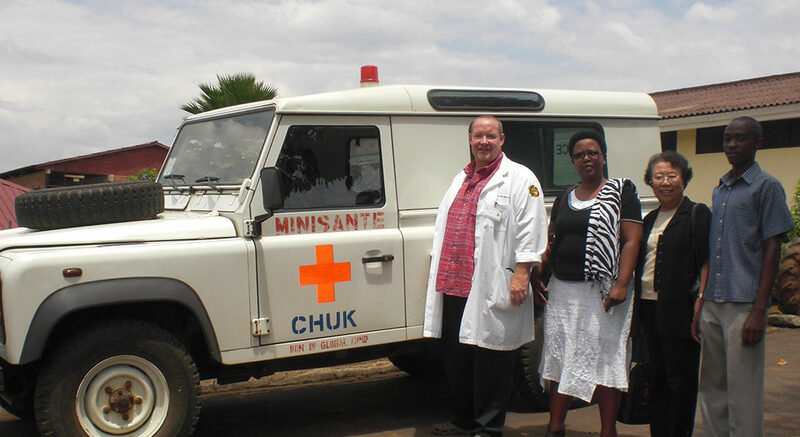 The first year of the partnership: Jeff Williams, teaching associate at UIC Nursing's Urbana Campus, with Rwandan nurse Christine Uwineza, former UIC College of Nursing Dean Mi Ja Kim and Rwandan nurse Narcisse Renzaho, stand in front of Centrale Hospital University of Kigali in 2013. 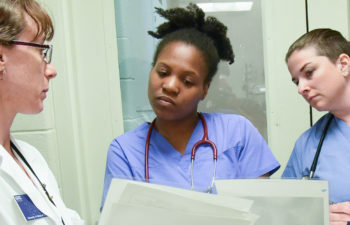 Williams helped build an emergency nursing curriculum and made recommendations for triage and standards for emergent nursing practice. UIC Nursing is one of five U.S. nursing schools selected to participate in the Rwanda Human Resources for Health Program. The goal is to improve nursing and midwifery, health management, medical education and healthcare human resources in the small African nation. Rwanda, a nation of 11.7 million people, has long faced a severe shortage of highly qualified physicians, nurses, midwives and other health care workers. 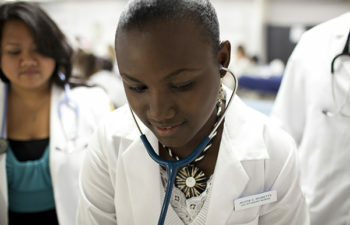 The Rwanda Human Resources for Health Program is believed to be the largest cooperative global health effort ever undertaken between universities in the developed and developing world. 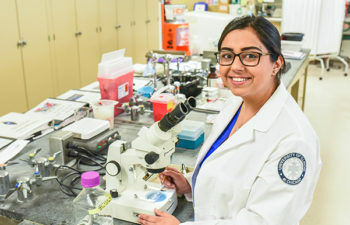 In addition to the five nursing colleges, twelve U.S. medical schools and one school of public health have also lent their assistance to this initiative. The program aims to “position the country to sustain the improved health workforce on its own, without foreign aid,” according to the Rwandan Ministry of Health’s website. 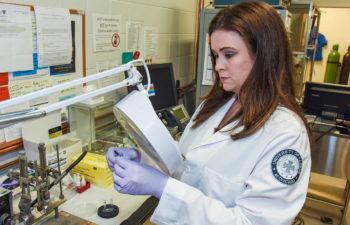 Rwandan faculty and clinicians in university colleges of medicine, nursing and midwifery, public health, and in clinical teaching hospitals will work with their U.S. counterparts to strengthen and expand Rwanda’s health professional curriculum and capacity. 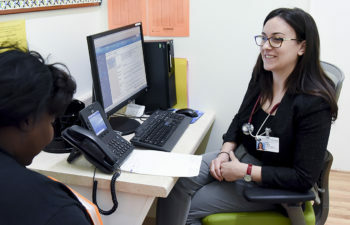 A coordinated approach is intended to “upgrade medical and nursing professions in a comprehensive way, according to a national government plan,” according to the Ministry. The UIC faculty members have been teaching and mentoring Rwandan nurses and midwives in the seven nursing schools located throughout the country. 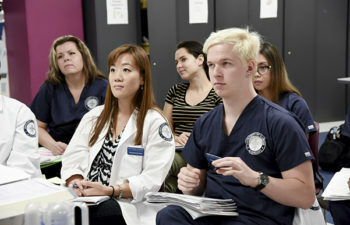 The UIC contingent has included Nurse Educators serving as the Partner to the Dean and as content experts in mental health, midwifery, pediatrics/neonatal; Advisors to School Directors; and as the Professional Standards Advisor; as well as Nurse Mentors in critical care, emergency/trauma care, and in midwifery. The Rwandan Ministry of Health has coordinated the program since its inception. The Clinton Health Access Initiative, a global health organization founded by former U.S. President Bill Clinton, provided critical planning and startup support. CITATION: Binagwaho A, Kyamanywa P, Farmer PE, Nuthulaganti T, Umubyeyi B, et al. (2013) The human resources for health program in Rwanda–new partnership (pdf). N Engl J Med 369: 2054–2059.